Bought two sets for twin beds -- Love the quilts and shams and the rope edging... wish the blue was a bit darker to match the extra accessories I bought, which are navy blue, but it blends in ok. Did not like the golden anchor throw pillows and will not use them. 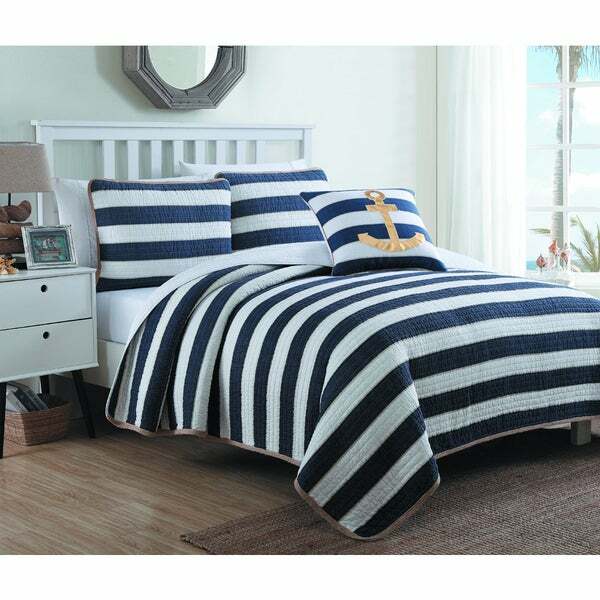 Take to the sea, or at least to a comfy nautical style with this plush cotton quilt set with polyester fill from The Curated Nomad. 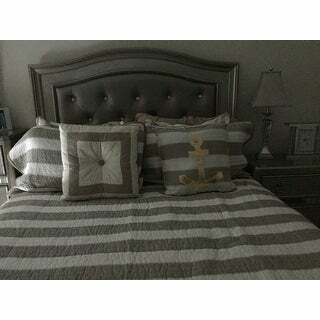 Featuring bold, contrasting stripes in navy and white, this quilt, sham, and anchor pillow set come together to create a rich bedding experience. Dimensions 8.0 In. X 18.0 In. X 18.0 In. I found this comforter set to be of not high quality at all, especially given the high price. It had a strong smell out of the package and after laundering it the navy blue color faded and the smell had not gone away. In addition, the comforter is not very substantial in size and therefore is better for a full rather than a queen sized bed. The throw pillow is cute and that's why I gave two stars rather then one. The quilt is good quality, but the colors are not what I expected. The white stripes are not crisp white, but have a gold pattern running through them. Although the pattern is light, not bold, it isn't as pictured. Also, the gold anchor on the accent pillow is a very shiny gold metallic material that doesn't have a high quality look. Overall, though the set is nice, though not exactly what I thought it would be. I will keep it. Beautiful quilt Fits mattress perfectly. Classy look for reasonable price. It looks great with my nautical theme bunk room . The only thing I wasn't crazy about was the gold applique anchor I think a navy anchor would have been a better choice. Definitely would recommend. My daughter loves this set! The quilt is soooo soft and feels soooo cozy! Great quality product at a great price. Definitely will recommend this to everyone! Comforter was as expected and true to color. However, the trim was not sewed on properly and sections were missed completely on the shams. I may just remove the jute trim, since the comforter and shams have a bias white trim already. In the photos, I thought the edging on the bed sheet was going to be gold. It's actually more like a natural hemp rope... it actually works better this way for my purposes, but if you were thinking that the trim matched the metallic gold anchor (which IS super "bling-y") you might be disappointed. I was not! Love this quilt! Good quality. Did not fade after washing and is the perfect weight going into summer. It’s not too hot. Great value for price. I would definitely recommend this addition to your nautical theme. This quilt set is just what I needed to make my son's room look amazing. product came in water stained I noticed it on one set, and it was replaced with another set that was water stained as well so I gave up. This is such a cute coverlet, but the quality isn't what i thought it should be. If the quality was higher, then I would have given it 5 stars. Order for our guest bedroom in our Lake House. I wanted something nautical and affordable without forsaking quality. This met both of my requirements. Absolutely love it! It's been washed no issues. Super cute. Highly recommend. Great deal for the price. The quilt is not the warmest, but I bought a down alternative to go underneath and it’s perfect! Super cute. "Dimensions are the same for all 3 sizes what is the size of the king"
"Is the anchor throw pillow included?" Looking forward to adding this new quilt set to my spare room! "The measurements for the queen and king are the same. Is that correct?" The full/queen size quilt is 86 inches wide x 86 inches long and the sham is 26 inches wide x 20 inches long. The King size quilt is 102 inches wide x 86 inches long and the sham is 36 inches wide x 20 inches long.